Every year I always pull out my gift tag stickers and label all my packages for friends and family. This year I am doing something much different! 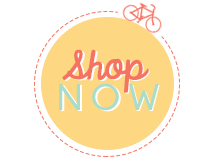 I am going to make all of my gift tags and add even more thought and creativity to those packages. As you all know, I am in love with the Champagne Glitter Paper! 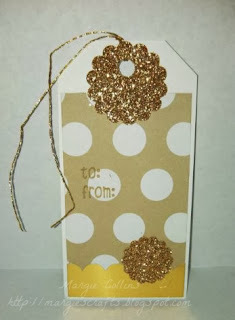 This tag was so easy to make and I'm making more this weekend to go on all of my gifts. I just measured a piece of white cardstock 2 1/2" x 4" and trimmed off the corners on the top to make it look like a tag. 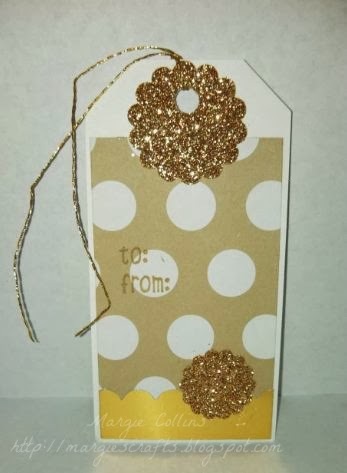 I then layered on my DSP, took my scalloped edge punch and punched out a piece of the Brushed Gold paper and then punched out the two scallops of the Champagne Glitter Paper. I punched a hole on top and threaded the gold string thru it and VOILA! Easy peasy!